The huge valley in this picture is Valle Di Chiesa (The vally of the Church). If you look carefully you'll notice that the valley is half of an explosive volcanic crater.... the other half has blown away long long time ago! The church (whose bell tower is visible) is quite in the middle of that ancient volcano. At sea level it's Porto. As usual .. the highest mountain in Filicudi, on the left, is Monte delle Felci. 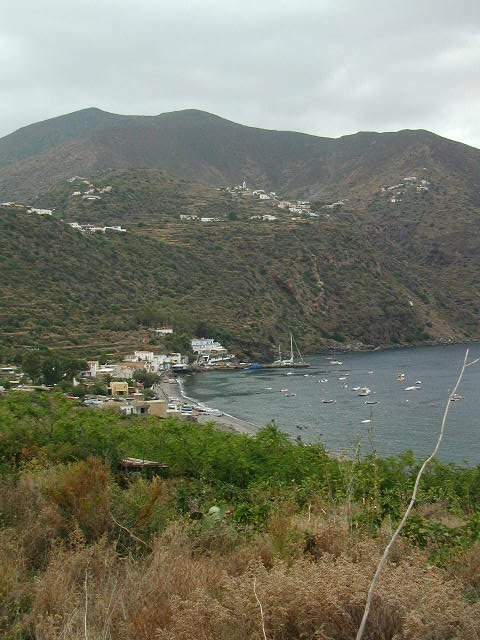 Here's a stereoscopic picture of Filicudi. Cross your eyes and dive into the third dimension dudes! Click here to learn how to see a stereoscopic image ! (C) Statement: all the images in this web site are under (C) of Roberto Zingales, unless explicitly stated. No one is allowed to copy, sell, or reproduce them without previous written permission by the author. Thank you.